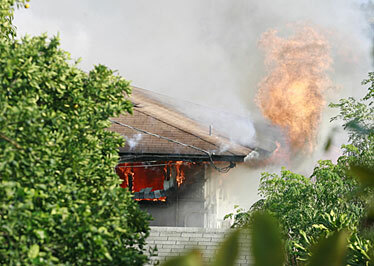 Flames leapt from a house in Kaimuki yesterday at approximately 3:20 p.m. The Oliveris flee their home and firefighters arrive, but the Kaimuki building "went quick"
Sonja Oliveri wore the only things she had left after a fire destroyed the two-story Kaimuki house where she lived yesterday: a green T-shirt, jeans and white socks. "We don't have nothing," Oliveri said as the house continued smoking behind her. At about 2:40 p.m., Oliveri smelled smoke and looked out her second-story window to see it coming from below. With only enough time to grab her 2-year-old son, she ran out the house, shouting at her husband that there was a fire. "I was just thinking it was a small fire, but it went up so quick," she said. "I never thought the whole house goes." Smoke could be seen from the H-1 freeway. Firefighters went to the house, at the end of a private driveway at 839-B 21st Ave.
"They saw a lot of smoke," said Honolulu Fire Capt. Terry Seelig. Five companies and 25 firefighters battled the blaze, which caused $600,000 damage and left seven people without a home. The fire extended rapidly to the rafters of the single-walled wooden structure built in 1951, threatening firefighters, who pulled out and fought the fire from outside, Seelig said. Oliveri's husband, Charles Oliveri, a lifeguard at Sandy Beach, was left with only the T-shirt and surf shorts that he wore. The owner of the four-bedroom house, who was not home at the time, lives downstairs; the Oliveris live on the second floor. Still barefoot, Charles Oliveri said he ran downstairs as his wife called 911. He first used a fire extinguisher to put out the fire in the office room. "It went quick," he said. He continued fighting the fire with a hose outside, knowing his family was safe. 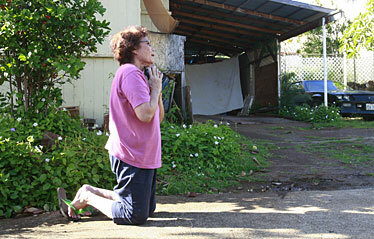 Kaimuki resident Pauline Catbagan prayed yesterday afternoon as a neighbor's house was ablaze. The smoke at first confused Pauline Catbagan, who lives behind the Oliveris. It came from a small window on the side of the house, and Catbagan wondered what the neighbors were spraying out of the window. "How come it's brown?" she questioned. "I moved closer, then the fire was coming out." She yelled for her son-in-law, Paul Sutton, to call the Fire Department and saw Oliveri spraying water into the window. Worried for her house only a few feet away, she joined him with her hose. "I panicked," she said. "I was praying hard." Guy Chinen, another neighbor, saw smoke. "The fire came up so fast, in seconds," he said. "It just exploded out of the windows." His neighbor and neighbor's friend, both off-duty firefighters, helped spray water on the house, he said. The Oliveris said they plan to stay with friends. Sonja Oliveri said the owner has insurance, and that was taking care of the recovery. Fire investigators were still looking into a cause and damage estimate yesterday.